Beijing yesterday slammed Taiwan "president" Chen Shui-bian as a "troublemaker" and "peace saboteur" while condemning his plan to scrap the island's guidelines on unification with the mainland. Li Weiyi, spokesman for the Taiwan Affairs Office of the State Council, China's cabinet, said Chen's scheme "fully exposed his obstinate adherence to his pro-independence stance." "This demonstrates once again that he is a troublemaker and saboteur of cross-Straits ties and peace and stability in the Asia-Pacific region," he told a regular press briefing. Li was commenting on Chen's January 29 speech in which he proposed abolishing Taiwan's "national unification council" and its guidelines on unification with the mainland. The council, Taiwan's top policy-making body on ultimate reunification with the mainland, was set up in October 1990 by the then Kuomintang (KMT) administration. Chen, from the pro-independence Democratic Progressive Party (DPP), has virtually kept the council dormant since he took office in May 2000, ending the KMT's 51-year rule over the island. Li accused Chen of publicly betraying his own "four no's plus one" commitment in his 2000 inauguration speech by seeking to eliminate the guidelines and the council. Chen is actually aiming to push for "de jure independence" for Taiwan through "constitutional re-engineering," Li said. In his "four no's" pledge, Chen said he would not declare "independence," change the "national title," incorporate the concept of "state-to-state" relations between the island and the mainland in its "constitution," or promote any referendum on changing the status quo in regard to independence. 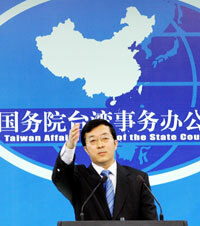 The Taiwan leader had also promised not to abandon the unification guidelines and the council. Chen's latest move is widely considered a touchstone of his cross-Straits policy because dissolving the unification council and its guidelines would be tantamount to changing the cross-Straits status quo. Following Chen's January 29 statement, even the United States Taiwan's main supplier of arms delivered a swift rebuke for his "inflammatory" comments. State Department spokesman J. Adam Ereli said on January 30 that Washington "opposes any unilateral change to the status quo by either side." At yesterday's news conference, Li quickly drew a line between the secessionist forces led by Chen and ordinary people. He stressed that Beijing would not change its solemn commitment to the Taiwan people because of Chen's deliberate provocation. "We will do anything that benefits the Taiwan compatriots," he said. As another goodwill gesture towards Taiwan people, the mainland authorities yesterday agreed to resume providing the island with fishermen ahead of the upcoming fishing season. Tang Wei, director of the Taiwan, Hong Kong and Macao Affairs Department under the Ministry of Commerce, told the news conference that fishing trade organizations from across the Straits will soon sign agreements on the issue. Beijing banned fishermen from working for Taiwan companies in December 2001 to protest against the island's discrimination against mainland fishermen hired by Taiwan fishing firms, which once employed 45,000 mainland workers.